OSWEGO, NY – There’s a new top speller in town. Holy Trinity Parish out-spelled eight other teams to earn its first Trinity Catholic School Corporate Spelling Bee championship. The words for the 11th annual fund-raiser were the hardest in the history of the competition. 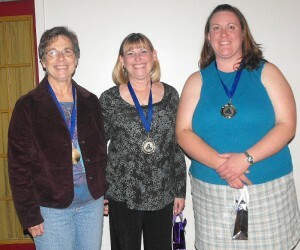 Members of the Holy Trinity Parish team pose with their first place medals. 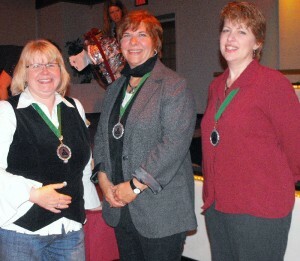 The 2010 champs are Linda Farden, Kathy Kreinheder and Lisa Kreinheder. At The American Foundry on Friday, nine teams spelled off to earn the right to claim the title and the championship plaque, engraved with the names of the winners. Besides Holy Trinity, the three-person teams included defending champs Mimi’s, five-time champion Fulton Savings Bank, Trinity Catholic Teachers (sponsored by Reynolds and McGowan, PLLC), St. Mary’s Parish, Team Furlong-Shanley (sponsored by Furdi’s Modular Homes and Shanley Law Offices), Canale’s, the Oswego County Historical Society (sponsored by Robert McKinstry) and newcomers Oswego County Opportunities. The teams battled back and forth on stage at the American Foundry for just about an hour this year. Early on, the teams never came close to the two-minute deadline on spelling, much less hit one minute for that matter. The first rounds usually feature easy words. However, there was some suspense. “I’d hate to see someone go out in round one like that,” he added. “Rutabaga” tripped up Canale’s in round two. “Would you like me to use it in a sentence?” asked Bruce Frassinelli, the bee’s pronouncer. “Never mind,” replied Harer with a slight laugh. Newcomers Oswego County Opportunities placed second in the 2010 competition. They are coming back in 2011, and plan to do better. The team includes Betsy Copps, Diane Cooper-Currier and Christine Prevost. As Cummings moved to hold the microphone for one team, he misidentified it as another team. When the Trinity Catholic Teachers added a “T” to the word “sachem” in round seven, there were just two teams left in the competition. Coincidentally, they were the top two teams listed in the evening’s program. With two teams left, it meant the winner had to spell two words correctly. If both teams missed the word, competition would continue. This, of course, jinxed both teams. Round ten’s first word was “horripilation” and Holy Trinity couldn’t get it right. So OCO was on the verge of winning if they could spell it and the next word correctly. However, they too misspelled it. In round 11 Holy Trinity nailed “grosbeak” but OCO stumbled on “asthmogenic.” Holy Trinity was able to figure it out. 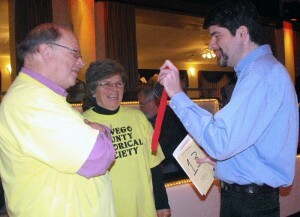 Justine White, an Oswego County Historical Society member, shows off his 2009 medal to members of the 2010 OCHS team Mary Shanley and George DeMass prior to the start of Friday’s event. White was captain of the St. Mary’s Parish squad. The bee featured several friendly rivalries. Father Eric Harer, captain of the Mimi’s team, jokingly lamented that he was spelling against his parishioners. “These are words taken from the national Scripps-Howard Spelling Bee, the same words the kids spell. A lot of them we’d never heard of. But if you know the root word, you go from there,” she added. “There were some words, that the other teams went out on, that we weren’t too sure about, either. There were definitely some words that we would have gone out on. The word that we both missed on, I have never heard of that word,” teammate Linda Farden added. Betsy Copps of Oswego County Opportunities agreed the words were tougher in the later rounds. “I can’t believe how tough some of those words were. I don’t think anybody’s ever heard of some of them,” she said. 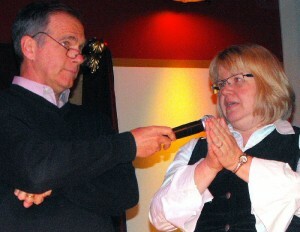 Betsy Copps spells a word as Dan Cummings holds the microphone for her. “We did pretty well for this being our first year. It gives us incentive to come back next year and do a little better,” she added. Previous winners are: Reynolds’ Law Firm (2000), Fulton Savings (2001, 2003, 2005, 2006, 2008), Pathfinder Bank (2002), Nestegg Credit (2004), Catholic Community of Fulton (2007), and Mimi’s (2009). The coordinators were Jane LeBlanc (event) and Jim Schreck (team). The event is designed to inspire educational values, team spirit and camaraderie and to raise funds for the support of the Catholic school, according to Principal Joe Lazarski. The word list is the same as the one used for the national scholastic spelling bee held in Washington, DC, each spring. The judges for the competition were Gina Pesaresi-Jones and Steve Yablonski of Oswego County Today.com. Following the bee, there was a silent auction, and Bernie Brzostek conducted a live auction featuring a huge variety of donated goods. Among the items up for bid were donations from Laker Hockey Camp, Rudy’s, Your House – Your Home, Bed – Bath and Beyond, Blue Moon Grill, Cook’s Jewelers, Advance Auto Parts, Torbitt’s, EconoLodge, Canale’s, Lighthouse Lanes, Trinity Catholic School parents and many others. For more information, call 343-6700.